This week I’ve challenged myself to do a meatless week. I am also fasting starting this week till February 19th as part of RCCG fasting. I’m fasting from 6pm-12pm daily, so I will not post a breakfast meal prep. Anyway, this is a meatless week. God help me. 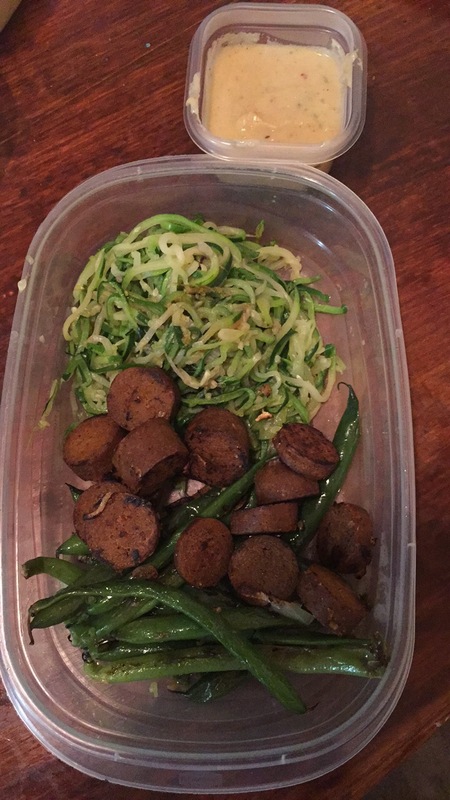 Almond milk Alfredo sauce over zucchini noodles with tofurky Italian sausage. The hardest part of this prep is making the sauce. I found this recipe that seems pretty easy. I’m surprised it calls for cauliflower, but that’s okay with me, they’re on sale right now. The rest of the prep is just making the noddles. Boil them, salt them. If you don’t like zucchini or don’t have a noodler, just use whole wheat pasta. Then heat the tofurky. Lentilloaf served with a sweet potato and kale salad. I really wanted to avoid doing a salad this week, but this looks so good. I mean look at it. I also have some lentils that have been waiting to use. I’m so excited for this. I’m going to be following this recipe. I think I’m going to do a tofu curry for a meal change up. This week should be interesting. I’ve never done a meatless week, come on, I’m Nigerian. Let’s see how this goes, I’m interested in seeing what other fun things I can do. I added green beans because mine were about to go bad. This tofurky taste great! It also has enough protein to get me through my workouts. This alfrdo sauce taste ok, but I only happen vanilla almond milk so yea. It has this sweet spicy thing going on. I’m making tofu stir fry on Tuesday night. That should be fun. Monday: The chicken in fridge is calling my name. Lol not really. It actually hasn’t been that bad. I did randomly crave a burger but I’m good. Thursday: This week has been easier than I thought. I didn’t workout as much as I wanted to, but I’m cramming three workouts before the weekend. Foodwise I can see myself incorporating a meatless meal at least a couple times a week.